Motivation: What Is It and Why Is It Important? Motivation is the driver for everything. Every action you take is dependent on motivation. Everyone is trying to figure out how to be successful. The foundational element of being successful is finding out what motivates you. 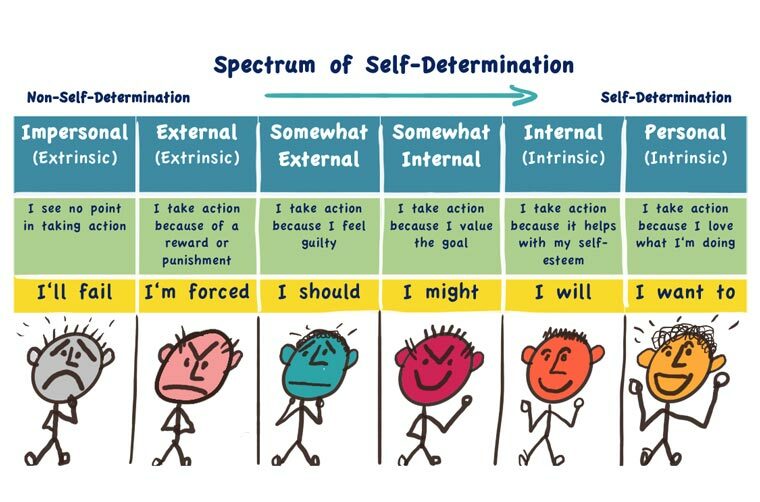 This article is based on Self-Determination Theory put forth by Richard M. Ryan and Edward L. Deci, authors of the book Self-Determination Theory: Basic Psychological Needs in Motivation, Development, and Wellness. Self-determination is the ability to make choices and have control of those choices. Motivation can either be enhanced or depleted depending on the type of motivation. It's important to identify and understand what types of motivation will move you to feel enthusiastic about what you're doing on a long-term basis. Self-Determination Theory divides motivation into two different theories or types. Intrinsic Motivation - The main feature of this motivation is that it is an internal feeling that says, “I really want to do this thing.” There is no external pressure. You and you alone are determining the action you are taking. This is sometimes called Self-Determination or Autonomy. This is the ultimate goal for well-being. Another important point is that intrinsic motivation builds on itself and there is a feeling of naturally moving forward rather than stagnating. Intrinsic motivation is at one end of a spectrum of desirability. Extrinsic Motivation - This is the least desirable part of the spectrum for a number of well researched reasons. The keyword is “pressure.” Whenever there is an externally imposed pressure, you are in a state of Non Self-Determination. The result of this is that your motivation will be depleted, not increased as with Intrinsic motivation. External pressure could be in the form of being forced to do something or because of a reward or because of an internal message like “I should do this.” For example, an impersonal order from a manager has been shown to result in an attitude of “there's no real compelling reason for me to make a strong effort because I believe my success is unlikely or impossible. I'll do it for the paycheck (for now) but I won't go the extra mile or innovate. When money is the only reward for work, studies show that motivation is depleted. Of course money is important but it must be coupled with Intrinsic motivation so that motivation is not depleted. I was at the hospital the other day and I asked the nurse how motivated she was to get up in the morning and go to work. Betty (not her real name) said that it used to be much better but that the culture changed. She told me she took a lot of initiative setting up the medical unit with procedures and practices that were working very well without any increase in pay. At her yearly review, her manager put “good” on the report. Somewhat dismayed, Betty asked “why did you only score me as good? I took initiative and did all this work without extra pay.” Her manager replied, “because that's your job.” As Betty told that story, you could see her motivation crushed and draining out of her. Question: Where are you on the spectrum? How can you move to more self-determination? Leave your answer in the comments below.